Today is 06 July 2014, I modified my MeMovingToCanada site's layout to make it more professional and organized. This will give a better impression and experience for my readers. I like the combination of black and white for this website because I can put an ad like my FREE eBook and the Upcoming Post section with Red and Blue font colors of the text in it. This emphasizes a lot more on the colored ads. Readers will take notice of it once they start to read the content. Transferred the the Google Adsense banner to the top of the post instead of the header. This, I think will give my header a space so it can be noticed. There are no more gaps between the navigation tabs and the post itself. The Upcoming Post also had gone upwards. I think it might be good to position it this way to get the attention of the readers. How Did I Changed the Layout? This is easy to those who are using blogger, that is why I recommend Blogger to you. In just two simple steps, you can change your layout quickly. Drag the Gadget to where you want it to be. Please give me your comment about my move. This might increase the number of readers at my site and I'm hoping that I earn more money from adsense, get advetisers and enjoy a lot from blogging. If you have some questions, please contact me at benalagnam@yahoo.com and also LIKE me at Facebook. Now, you know that blogging is sharing any type of information in the internet. The next thing that you need to know is how does a blog in the internet works? What really happens when you type in to the computer. I know that most of you know the answer, but for the benefit of the doubt, I'll explain it further. Sharing information in the internet is quite difficult if you don’t know about the basic of the internet or network connection. So, I’ll explain to you how do network and blogging works. Internet is a global system of interconnected computer networks, where the information is stored in a building facility with lots of hard drives or storage in it, called the Server. These hard drives have the same function with the computer's hard disk that you’re using right now, which stores information in a form called a data. But, these are two times or more powerful than yours. It needs to handle a lot of data from other customers as well. These data can be stored and retrieved anytime as long as you have a connection between your computer and the Server. The people that serve your connection are called the Internet Service Providers (ISP). They install cables and satellites or any wireless communication device in order for it to connect your computer to the Server. The ISP is the reason why you are paying your internet billing every month. If you take out one of the two, either the Server or the ISP, from the system, then you will not have any internet connection. Let’s say you are sending a tweet using the Twitter, once you write something at the tweet box and presses Enter, that information is stored as data. These data will be interpreted by the computer and will be sent through the Internet Service Provider line and to the Twitter Server. Twitter will then store this data in their server with your address or Twitter account in it. 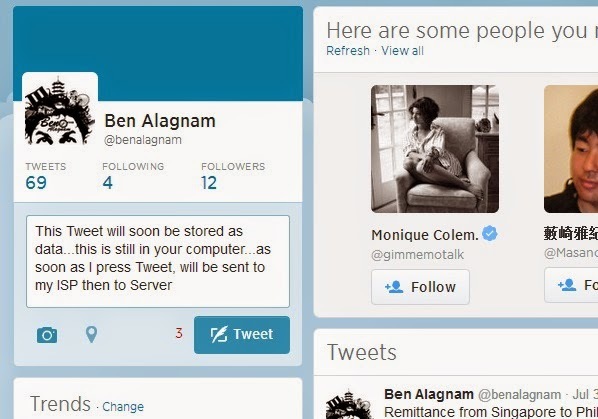 After it is stored, Twitter will then send the information back to you through your ISP. This time, the message will appear at the Twitter tweets in order for you and your followers see your message. What is the Recommended Server for Blogging? Now, blogging is the same with this layout. In the use, like you, to server connection, you need to connect with a Server and register an account, so you can make a storage for your blog website. Websites are handled by servers and there are lots of them in the internet. Few common examples are Twitter, Facebook, Google, Yahoo others. Your account in one of those mentioned is a data storage in their Server facilities. When you access your account, you are then connected to that storage space in their Server. Then you can open, retrieve, edit and save your data anytime with an internet connection. For beginners, I recommend to use the Blogger. These are the advantages for this Server. Blogger is owned by Google and you know who's this giant, right? It takes care of your blog website well. You can change your URL address as easy as ABC. You can monetize, make money, in it immediately after having an account with Google Adsense. You can edit the face of your Website. Check out my next post on to "How to Setup a Blog Website in Blogger?". 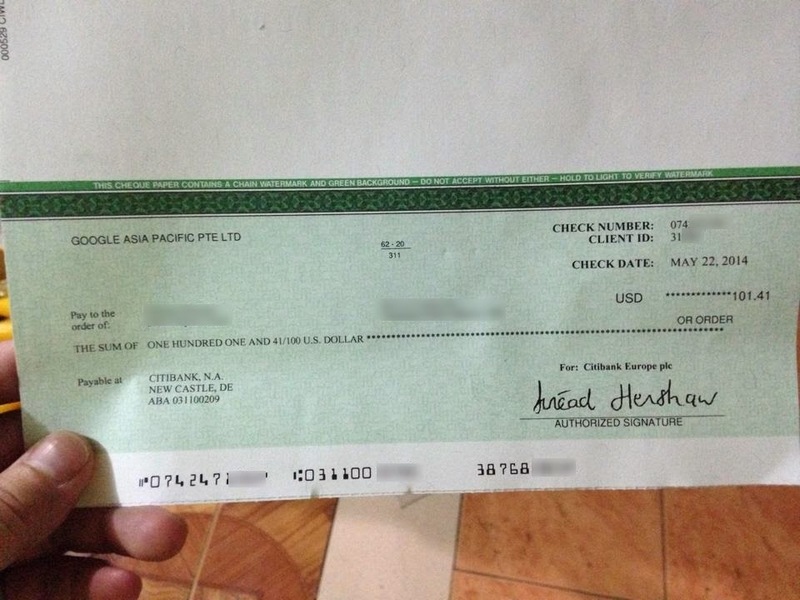 Few years ago, I was inspired with some internet bloggers showing their earnings from Google or other sponsors. It was a longtime dream for me or even to other bloggers as well. Since I had an existing blog, BenAlagnam.com, I opted to try this route. Clueless but inspired, I researched through the internet on how to setup one. Until I found the solutions and immediately updated my blog to a money making machine. No, it's not what you think as a HUGE money making machine, but a money, in cents, making machine. Google Adsense is not the best way of making money online. Soon you will find out why as I go along with Make Future Income. It's only the start-up goal for beginners, like me. This will keep a blog alive and the blogger's motivational level will be at high peak. All of these are true, BUT, a lot of time, effort, and money are poured into the system. This is not an easy-build-easy-money system. This is a system that a newbie cannot do with limited knowledge on the concept of blogging, marketing and coding. I am fortunate that God gave me the ability to withstand long hours of research in the net. It doesn't tire me easily. They said that it's unhealthy to stare at your computer for long hours, but HEY! I love doing it. Before I go blind or die, I'd rather had build a lot of empires than having a healthy life but not doing something. Now, let me get you to the point here and give you an idea on what I meant for Make Future Income. But first, I'll show you my evidence. To protect my privacy, which other bloggers do most, I blurred out my name and some important details in it. The important things here is that USD101.41 written on the cheque. That is what I'm talking about Make Future Income. This is not my first cheque and I'm positive that I'll be getting more of it in the future and maybe some sponsorship as well. My time is not dedicated on this blogs because I'm busy working in Singapore. I blog only if I liked to, there's no pressure in it. About and hour or two, I just give few posts about important information that happened to me that day or week and leave my post in the internet for my readers to read. Then the magical thing happens, I get few cents for it without doing hard selling and marketing at my side. I popped few posts at my Facebook and Twitter account and that's it. But, of course, there are other techniques to do it, but I tell you, it's not that difficult. This will take you around a total of 6 hours a week doing it. Follow me along the way and I'll discuss it slowly one by one. Blogging is forever anyway. If you like my comment or have some questions, please contact me at benalagnam@yahoo.com. If you want to apply for a Permanent Residence, the Federal Skilled Worker in Canada, visit my MeMovingToCanada blog.